The Calvert Alliance Against Substance Abuse, Inc. (CAASA) in partnership with local law enforcement, Calvert County Government, Calvert Health Department, Calvert Opioid Intervention Team, Twin Beach Opioid Abuse Awareness Committee, and local fire and rescue squads installed three (3) heroin/opioid awareness signs. The signs are located at the Prince Frederick Volunteer Fire Department, North Beach Volunteer Fire Department, and Solomon’s Volunteer Rescue Squad and Fire Department. “It is our hope that sharing the information in a public way will encourage residents to take notice and take action, stated Kristen DePhillip, President, CAASA Board of Directors. 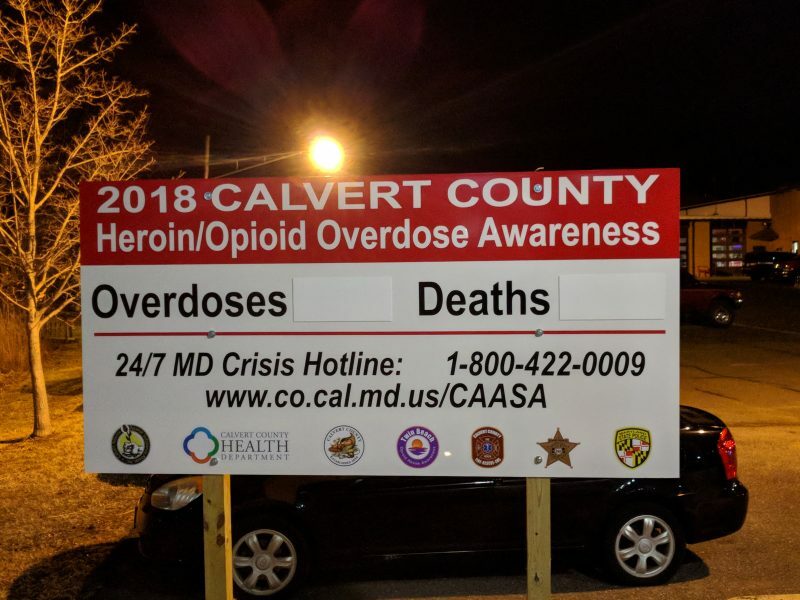 CAASA is responsible for updating the signs with current overdose numbers and will do so at the end of each month with information obtained from the Sheriff’s Office Drug Intelligence Officer. 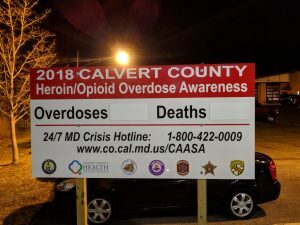 Along with the overdose numbers, the signs share the 24/7 Maryland Crisis Hotline number (1-800-422-0009) and a link to the CAASA website (www.co.cal.md.us/CAASA) for a list of support services in Calvert County. Overdoses in Calvert County increased from 98 (15 fatal) in 2016 to 183 in 2017 (33 fatal). “We’ve got to work as a community to prevent the loss of any more of our citizens. Knowing what we are dealing with and where to go for assistance is key,” stated Sheriff Mike Evans. For questions regarding the signs, please call the CAASA Office at 410-535-3733. This entry was posted on January 31, 2018 at 1:28 pm and is filed under All News, Calvert News, Community, County, Fire & Rescue, Law Enforcement, More News, z 600X120 Top Ad Bottom, z 600X120 Top Ad Top. You can follow any responses to this entry through the RSS 2.0 feed. Cue the ignorant comments from ignorant people on here. Do you have something to contribute to the conversation or are you just going to continue to post your ignorant comment? What is your solution? Send them all to rehab on the taxpayers hoping that 10 out of every 100 will get clean? Give them unlimited resources to fix a problem they created for themselves and most don’t want fixed? At least I gave a possible solution in the post below yours. Years ago when being a junkie was shameful and people knew it was their fault and there were much stricter punishments the problem wasn’t as wide spread as it is today. So do you have to be a junkie to get some of that free taxpayer money or can anyone take advantage of it. Must be nice to know you can stay high, break laws, and suffer very little consequences. As for the rest of us we will continue to do the adult thing like go to work, pay taxes, and follow the laws so they can afford all these junkie perks. If this were 20 years ago the number of overdoses and deaths would be the same and there would be a lot fewer of both due to stricter punishments. Unless the addict wants to get help themselves, there is nothing anyone can do to make them better. “Awareness” is always the answer. Just look how many problems we had that have been resolved by putting up awareness signs! Let them die. Worthless junkies. Your ignorant comment is totally asinine. Hopefully no one in your family or a love one is a victim of this terrible addiction. Grow up douchebag! Well clearly we could use a positive comment concisering the comments from above ^^^. My guess would be they don’t have anyone close to them suffering from addiction . That they’ve never seen someone they love unconscious on the floor from a drug that over took their life . No one wants to be a drug addict but things happen . My brother has been clean for over a year . It wasn’t an easy process . I rushed to the hospital 3 times scared to death that he was really gone this time . But so what it took 3 times . He’s clean now Why? Bc he was AWARE of his problem .his family was AWARE. His friends were AWARE and we pushed him and supported him and he pushed himself and bc of how AWARE we were he’s alive today and clean . I think the signs are great and believe awareness is part of the solution . Well you’d be wrong. Had a sibling that I wrote off a long time ago. Not sure where she is and don’t care. After stealing from me, the 5 times my parents paid for rehab, the stealing from our grandparents, bailing her out of jail, scum bags showing up at the house in the middle of the night. I congratulate your brother, but he is in the minority and I hope he can stay clean but the odds are against him. Being AWARE is not enough. It starts with making better decisions. They should also include names of people of OD & Died… How many duplicates would be listed on the OD side?